Plasmid DNA from E. coli. Extremely time saving (up to 10 times faster than the market leader). Only one centrifugation step at 700 × g or 1 min vacuum (regulation of the vacuum is not necessary). Nearly loss-free DNA preparation from small amounts of starting materials (80-90%DNA recovery) e.g. forensic application. Avoiding of waste (disposals and chemicals). Ready to use kits without dangerous chemicals. 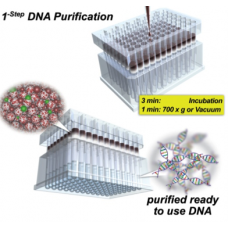 No expensive equipment needed for purification in 96-plate format (e.g. “high throughput” at the workbench with the nexttec™ cleanVac96 for 10 *96 plates purifications in one hour after lysis). Easy adaption in all robotic systems with vacuum or centrifugation unit (max. 700 x g).